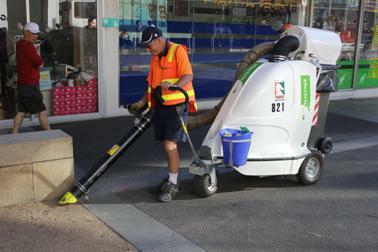 The Whitehorse City Council recently introduced the Glutton Zero Emission Vacuum Litter Collector to assist them in keeping their Box Hill Mall precinct clean. This implementation arose from the need for a cleaning solution that can be utilised during business hours quietly and unobtrusively. It was apparent after a demonstration to Ilias Kostopoulos, manager of City Works at Whitehorse Council, that all requirements would be fulfilled by using the Glutton. By changing their current methodology it enabled the delivery of mechanised, quiet and emission free services during business hours. Ilias Kostopoulos spoke about the addition to their cleansing operations in 2013. "The Box Hill Central Activity Area is the highest profile shopping, café/restaurant, business, education and transport hub for Council attracting over 100,000 pedestrians a day, visiting the array of cafes, restaurants, businesses and shopping outlets," he said. "Attention to cleansing detail throughout the shopping and business area is paramount. The new Glutton machine is used by the township cleaners to remove small litter items such as cigarette butts, food wrappers, paper and leaves. "Council's township cleaners attend to large litter items with ease but sweeping excess leaves, removing small items of litter found in garden beds particularly cigarette butts is time consuming. Since the introduction of the Glutton at the Box Hill Central Activity Area, the area has become almost free of cigarette butts, leaves are no longer a problem and garden beds look good. "The Glutton has the ability to clean effectively and efficiently where sweeping and cleaning by hand was often ineffective. Using the Glutton we can vacuum everything from cigarette butts and leaves through to bottles and food packaging with ease and efficiency. "We found that the Glutton is suitable for use in our township areas due to its inherent design qualities, size and ease of manoeuvring safely and efficiently about pedestrians and visitors. "The Glutton has been widely accepted by the community for use in the Box Hill Central Activity Area since its inception." The Glutton has proved to be a huge success around the world with over 7000 units in operation in 52 countries. Australia, just like most parts of the world has experienced a boom in residents living in major cities, making after hours mechanised cleaning difficult due to noise curfews. This type of living is now reaching the suburbs with many smaller apartments popping up in smaller shopping precincts and shopping strips. Noise emitted from pavement cleaning seems to be one of the major complaints being received. This type of residential living has been the case in most parts of Europe and the UK, since the early 1990s. To combat this the Glutton was developed and introduced in 1992 to enable local councils to deliver quiet and emission free services during the day and collecting litter whilst it is being generated. "The quietness of the Glutton means it's not intrusive when cleaning the area where people are gathered, having lunch, meeting or and socialising," Kostopoulos said. "The battery life provides a full day's use of cleaning and its compact size and manoeuvrability provides ease of use for the operator." Conducting mechanised cleaning during business hours also displays to business owners, visitors and rate payers that councils are providing a professional service. No other vacuum cleaning machine can deliver day time cleaning services quietly and emission free whilst pedestrians are present. 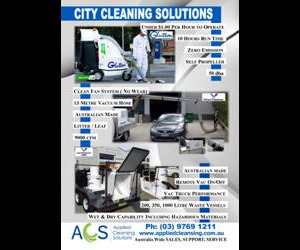 Council cleaning departments also benefit by reducing their costs associated with night cleansing operations and eliminating the risk aspects for their staff associated with night shift cleaning operations to footways, malls and city centres. The Glutton is a mobile, easy-to-handle machine which collects all kinds of waste in both indoor and outdoor applications. The machine's innovative filtration system emits return filtered air to less than one micron. This feature along with a width of 750mm allows the Glutton to pass through a standard 820mm doorway. 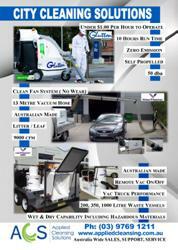 The vacuum system is powerful enough to deal with urban waste, paper, cans and plastic containers. Difficult items like sand, silt and dust are no problem for the Glutton. It will work for a whole shift of eight hours before requiring charging. Charging the traction battery pack is simple via the unit's onboard smart charger and requires a standard 240 volt power supply. Purpose built trailers can be supplied to carry one (1) or two (2) machines with spare 240 Litre wheelie bins. James Daniels, managing director of Applied Cleansing Solutions commended the council for putting the Glutton to good use: "(ACS) congratulates and thanks Whitehorse City Council on being the first council in Victoria to introduce the Glutton into their cleansing department." To find out more about the Glutton solution contact Applied Cleansing Solutions on 03 9769 1211 or visit www.appliedcleansing.com.au.